High performance shredder for centralized and bulk shredding. Capable of shredding up to 39 sheets of 80gsm A4 paper at a single pass. Wide Entry format (Shredder mouth 405mm wide) for shredding of A4, A3 and computer listing paper. Cross-cut cut 4x40mm, P-4 security level. 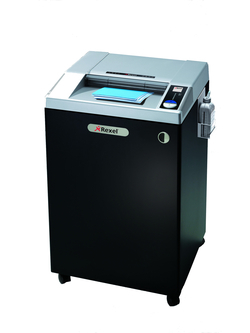 Jam-Free function reverses paper out of the shredder, and it features a front opening door with a large 175 litre removable plastic bin and retractable metal frame for holding plastic bags of 225 litres. Electronically controlled safety flap in the feed opening. Auto cut-out when bin is full or door is opened. Automatic oil injection on the cuttings shafts during shredding operation for constantly high shred performance. Powerful 1600 Watt single phase motor. Shreds staples, paperclips, credit cards and CD’s. Continuous operation. 2 years machine warranty, 20 years cutting head warranty.